Amazon.com description: Product Description: Good communication is essential to any healthy relationship, whether itÃ¢ÂÂs between spouses, family members, friends, or co-workers, and mindfulnessÃ¢ÂÂthe practice of nonjudgmental awarenessÃ¢ÂÂcan help us communicate more effectively and meaningfully with others in our personal and professional lives. Here, Susan Chapman, a psychotherapist and long-time Buddhist practitioner, explains how the practice of mindfulness awareness can change the way we speak and listen, enhance our relationships, and help us achieve our goals. 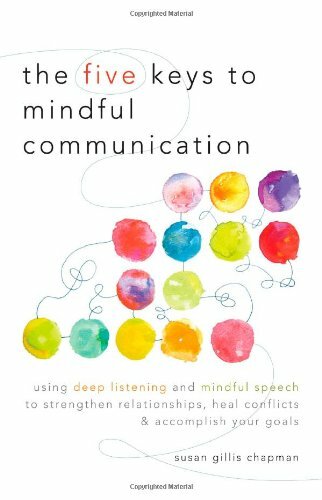 ÃÂ ÃÂ ÃÂ Ã¢ÂÂ¢ÃÂ and learning how mindful communication can help us to become more truthful, compassionate, and flexible in our relationships. About: Good communication is essential to any healthy relationship, whether itâs between spouses, family members, friends, or co-workers, and mindfulnessâthe practice of nonjudgmental awarenessâcan help us communicate more effectively and meaningfully with others in our personal and professional lives.